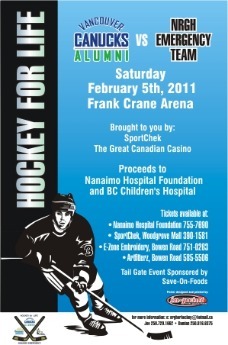 Exciting action on the ice will be taking over Frank Crane Arena in Nanaimo this weekend with the Hockey For Life charity game. Alumni from the Vancouver Canucks will be squaring off against the Nanaimo Regional General Hospital (NRGH) Emergency Department hockey team to raise funds in this hotly anticipated game. An event that’s fun for the entire family, all proceeds will benefit the NRGH’s Emergency Expansion Campaign and BC Children’s Hospital in Vancouver. The puck drops this Saturday, February 5th and tickets can be purchased for $20 each. Grab yours at the Nanaimo & District Hospital Foundation office (102-1801 Bowen Rd), SportChek at Woodgrove Mall, E-Zone Embroidery (3 – 1925 Bowen Road) or Artfitterz (15 – 1925 Bowen Road). To learn more about the NRGH’s Emergency Expansion Campaign, visit the campaign online or track the progress on Twitter.